Approx.10-13 minutes walk from JR Nada Station, or Hankyu Oji Koen Station. From JR/Hankyu/Hanshin/Subway Sannomiya Station, take City bus No.2 to Hankyu/Rokko , or take No.18 to Maya Cable Line. From Hankyu Rokko station, take City Bus No.2 to Sasnnomiya. Get off at Aotani bus stop and head towards south. 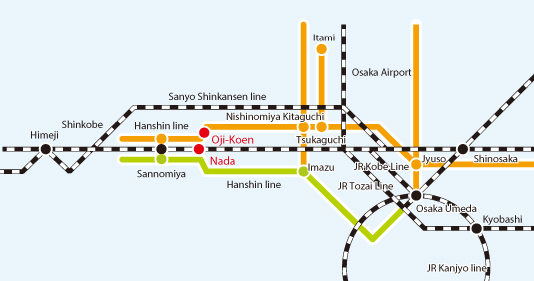 《Nearest stations》JR Nada station, or Hankyu Oji Koen Station. Please call main office outside of office hours. Copyright © 2008-2019 Kobe Kaisei. All Rights Reserved.